Naxos is the largest island of the Cycladic complex. This Cycladic island is situated in the middle of this complex and is connected all year round with Paros, Mykonos, Tinos, Syros, Santorini, Ios and Mikres Cyclades, Amorgos, Koufonisia. The island has been inhabited since Prehistoric period. The first inhabitants brought their gods. According to Greek Mythology, Zeus was born in Crete but he was brought up here from whom the highest mountain of Naxos -Za - was named. Dionysus, the god of joy and wine, met Ariadne, King Mino's daughter, here. Both helped Naxos to flourish. The earth of this island is unusually fertile for a Cycladic island and it provides almost everything. 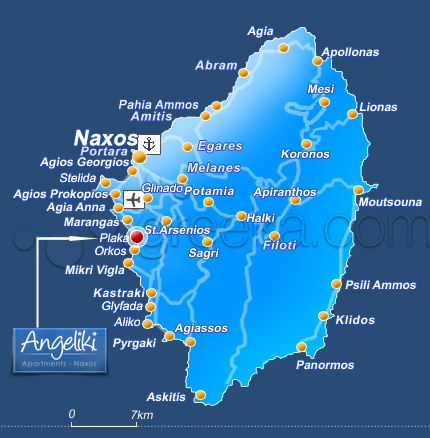 Naxos supplies not only the Naxians but also many Greek islands with a great variety of products. The renowned potatoes, "graviera" a kind of cheese, wonderful wine, meat of excellent quality and olive oil are some of the main products which can be found not only on the island, but also in Athens. The subsoil is also rich. The famous marble of Naxos is a very valuable product of our island. Today many people from the northern island work in marble quarries but the island depends on tourism for much of its income. Heavenly beaches with crystal water surround the island. On the south, there is the scenic and unforgettable beach of Agios Prokopios which leads to Plaka and Plaka beaches. Thousands of tourists are enchanted by the endless kilometers of sparkling clean beach which offers ideal conditions for water sports. One of the main characteristics for Plaka beach is the place where rare cedar trees grow in the hot sand. It is worth visiting Naxos because of the golden beaches, the great history and the traditional hospitality.